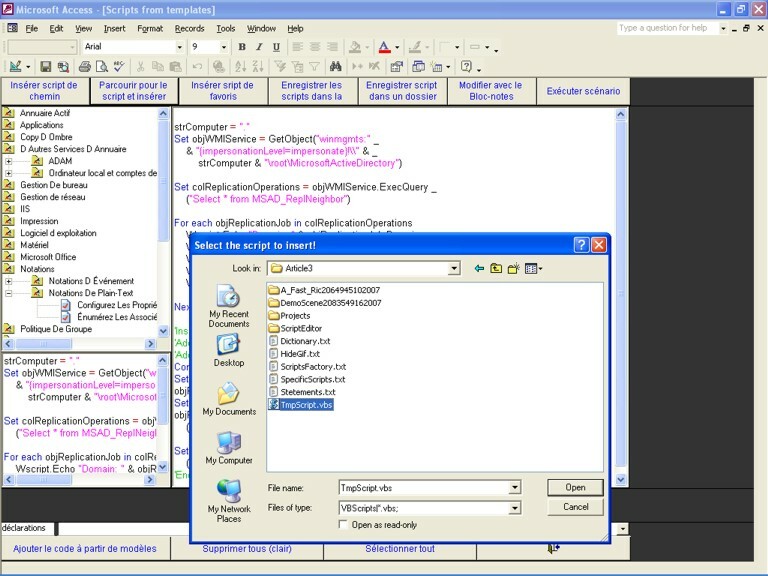 MSAccess database with over 2000 predefined scripts. Multilanguage support: French and English. Syntax colouring : colorized code looks like in VB. Run code direct from program, import scripts, edit script and save scripts.Search and filter options: full-text search and filter. Scripts manager: scan your computer or just a folder to find all scripts and save all those addresses in database with name and full path. Many predefined statements. VBScript-Mania includes a syntax colouring control. This is a special rich textbox that colour your code. Colorized code looks like in Visual Basic interface. You could run code direct from this control, import scripts from templates, and edit script with Notepad, direct save the script and many other options. In order to save or to run a script you don't need to copy the script, paste it into Notepad, and then to save it as a .vbs file. Instead, you could save or run scripts direct from VBScript-Mania interface. Qweas is providing links to VBScriptMania 1.0 as a courtesy, and makes no representations regarding VBScriptMania or any other applications or any information related thereto. Any questions, complaints or claims regarding this application VBScriptMania 1.0 must be directed to the appropriate software vendor. You may click the publisher link of VBScriptMania on the top of this page to get more details about the vendor.